Erika Rees and Scot Seitz are handing out gloves and goggles to sixth-grade students at a charter school in the Atlanta neighborhood of Kirkwood, where Seitz teaches earth science. The students, buzzing with excitement, are about to observe the effect of a weak sulfuric acid on common building materials. It's part of a lesson on acid rain designed by Rees, who is an MPH student at the Rollins School of Public Health (RSPH). Briefly, a playful rebellion sets in among the ranks—idle complaints quickly placated by assurances from the leaders that, yes, it is necessary to wear safety equipment while handling even weak acids. The students settle back down with an "I'm-only-doing-this-because-I-like-you" sort of smirk. At the end of the lesson, after the acid is poured and the observations are logged, Rees gives the students permission to remove the goggles. Most of them keep them on as they answer questions about the chemical reactions involved in acid rain, discussing the carbon emissions of cars and factories. Seitz takes some time to give a shout out to Rees, explaining to the class that she created the lesson and supplied the materials for the day's activity. One student gives Rees a hug on the way out. "We really don't do things like this normally," says Shannon Davis. "We usually take a lot of notes and stuff." Rees' experiment and working relationship with Seitz during the spring semester was the result of a new educational partnership between the RSPH and Teach for America (TFA) called Classroom to Community. The idea for the initiative came from a discussion between MPH student Sahar Salek, who was looking for applied, practical experience, and Ariela Freedman, a research professor at the RSPH and a TFA alumna. 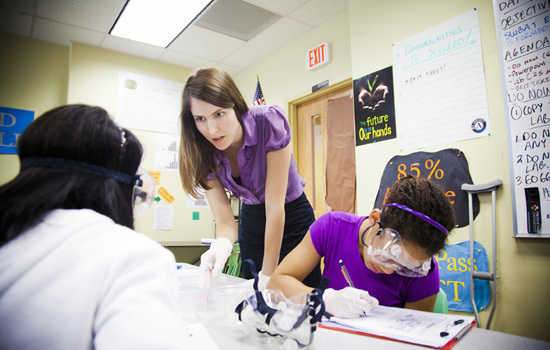 The possibility of a program grant from Emory's Office of University-Community Partnerships gave birth to a grant proposal to put RSPH students in classrooms with TFA corps members as mentors to help them learn to teach health lessons to Pre-K-12 students across metro Atlanta. "The partnership is a launch pad for using schools as a vehicle to teach critical health skills to the next generation," Freedman says. "We give our MPH students the tools to become effective teachers through the hands-on experience they get partnering with a TFA teacher in an under-resourced Atlanta public school." Although it offered no course credit, the newly minted program drew in a landslide of nearly 40 applicants. Of those, 15 RSPH students were chosen to be mentored by TFA teachers and hone their teaching and leadership skills. They are teaching everything from lessons in mental health to health careers. Audra Williams, a joint MD/MPH student at Emory and TFA alumna who co-taught the course, says the program helps RSPH students, TFA corps members, and their students alike. "We all need to take on that responsibility to learn what's going in our schools and in our community. This course provides the real-world experience that puts a human face on the statistics about kids and health."